Wisconsin-educated renowned communication scholar, Prof. Won Yong-Jin of Sogang University, has been elected by unanimous decision as the next president of Korea Association for Communication and Information Studies (KACIS). The decision was made on August 20, 2008 in KACIS' general meeting. Prof. Won will serve as KACIS' 11th president for two years until April of 2010. He is now professor at the Telecommunication Academy, Graduate School of Mass Communication, Sogang University in Seoul. The 51-year-old scholar was born in Jinhae, South Gyeongsang Province on Nov. 28, 1957 and graduated from Sogang University with journalism major. He completed his PhD in Communication Arts at the University of Wisconsin at Madison. 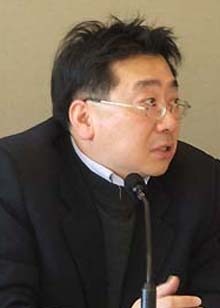 He also served as professor of Dongguk University's Journalism Department. "Paradigm of Mass Culture," "Criticism on Television," Formation of Modern Mass Culture," "Diagnosis of Democratic Process of Korean Press," and "PD Journalism." Prof. Won also frequently appeared on the local televisions as a media critique. Prof. Won served as president of the Korean Association for Visual Culture, and he was one of the nine commissioners of Korean Film Council. He has also published numerous articles including "The Construction of National Reality: The Articulation of Traditional Culture in Korea (1992)." One of his articles, "Model Minority Strategy and Asian-Americans Tactics" appeared on Korea Journal.